As we gathered in Rabat we began the Fence meeting, by meeting ourselves. We heard from each participant a little about what was pre-occupying them – the situation where they are, and also their own work.. The Fence was introduced as a network, what it is, how it works. Given our Syrian colleague’s presence we were all too conscious that professional and personal circumstances were inevitably intertwined. We delivered a week of dramaturgy. We worked in English and French. At the start of our visit, we met young theatre makers, and through workshops based at the Kanfaoui Room at the Mohamed V Theatre, with a core team of 8 of them, began to develop early work around our thematic focus – how change is manifesting. All this gave us additional snapshots of the playwriting landscape in Morocco and provided us with an initial foothold, but it was clear that we need to learn much more. What will be the process of creating new dramatic texts in Morocco? What will be the processes of production and publication? 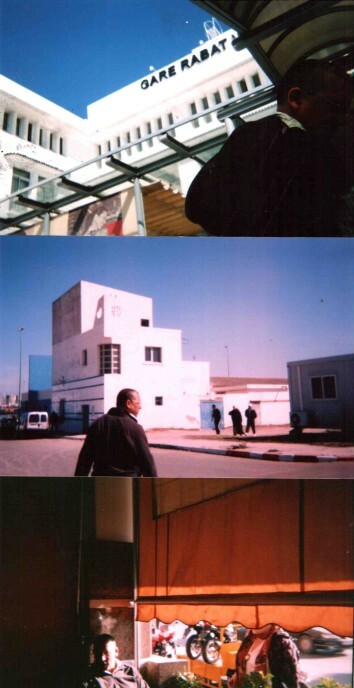 Rabat, Casablanca?, Adadir?, Tangier? Fes? Marrakesh? What will be the level of artists working? Professional? Emerging? Student? What will be the communication flow? Who will be the partner institutions? Who are the key individuals to move this forward? What could be the role of The Fence network? Or selected individuals drawn from it? What are the resources required for each stage? Who are the funders and where else can they be found? The poet and playwright Abdellatif Laâbi spent nine years in a Moroccan jail in the 1970s. Freed by international pressure, he has lived ever since in Paris. But earlier this month (March 2012), for the first time ever, his play Exercices de tolérance (Studies in the Exercise of Tolerance) was performed in the Moroccan capital, Rabat. Not only that, but it was performed in the country’s national theatre, the monolithic Théâtre Mohammed V, bastion of state-sponsored light entertainment and theatre (which sports what looks like a million-foot curtain drop on its giant pros arch stage). Directed by young Moroccan theatre director Mahmoud Chadi and acted mostly in Moroccan dialect (with French subtitles) by Moroccan theatre company Nous Jouons Pour les Arts, the show pulls few punches in its extended series of sketches. Half-naked, masked girls in a harem beg an unnamed dictator/king to "come on our faces… beat us… execute us." The same "dictator", taking live questions from the audience, is asked "What do you think of freedom of speech?" and replies "You are asking the question. Isn’t that freedom enough?" The audience laughs nervously. "But I would say this to you ladies and gentleman of the press," he goes on. "Weeds need to be cut down." Rimbaud and Scheherezade have a random encounter in a supermarket. Slam dancers waltz the stage. A street sweeper meets a rich man. "What are you doing?" asks the rich man. "Cleaning the street," comes the reply. "What are you saying? What are you implying? Are you saying it’s dirty here?" Menace and unease are in evidence throughout, and it’s strong stuff for what, on the face of it, is a strongly conservative Islamic country. One swift and easy conclusion is that Morocco, which has to date seemed more or less immune to the "Arab Spring" phenomenon, no need of revolution. Because it is already a liberal place. A progressive King, for whose grandfather the theatre is named, has steadily relaxed the grip of the State, recognized the Berber language Amaziri as a third official Moroccan language (alongside Arabic and French), encouraged the arts… and built a sparkling new tram system in Rabat. But as ever in the endlessly subtle world of Arab politics, things may not be that simple. I was in the audience as a member of the international playwrights group The Fence (www.the-fence.net), visiting Rabat for a week’s workshops with young Moroccan writers and actors, at the invitation of the Ministry of Culture. We didn’t pay for our tickets. But then, it turns out, nor did anyone else. All five hundred-odd spectators have been invited personally. There has been no advertising, not even a poster outside the theatre itself. There is no programme (although, as it turns out, there rarely is in Moroccan theatre). We meet later with the well-heeled young director, who wears large Harry Potter glasses and explains his approach to the play. "I photocopied all the pages and went through them making two piles," he says. "The parts that I liked and the parts I didn’t. Then we did a sort of mash-up and the result is what you saw. That’s my process." That’s the gist, anyway, of what he said. Fighting talk, in a restaurant full of playwrights. But whatever one thinks of the process, there is perhaps a message here. And the message is that the works of Abdellatif Laâbi belong to history. His attack on the state of Moroccan politics is also a part of history: not relevant to today, available for mash-up, reinterpretation – raw material for a piece of zingy shock theatre. And zingy shock theatre is OK, so long as we know exactly who’s in the audience. And we do. Perhaps this isn’t quite what it seems. Meanwhile, down the street, tired riot police are beating up a small group of tired demonstrators outside the parliament building, as they protest, rather listlessly, about unemployement. Arrivée de Natalie et Jérôme avant tout le monde. Installation au riad prêté par Jawad (cie…) en attendant de régler les problèmes de logistique... Diner avec Mohamed. Natalie et Jérôme jouent aux touristes en attendant l’arrivée des autres. Visite du vieux quartier autour du Riad, Déjeuner somptueux au bord de la mer, thé à la menthe et lecture au soleil dans les jardins de l’Oudaya. Le soir, rencontre avec des étudiants de deux écoles de théâtre, l’Isadac, dirigée par Latefa et Saïd, et une autre école ( nationale) ainsi que des auteurs et metteurs en scène marocains. Présentation du Fence, des membres présents et des différentes possibilités d’échanges entre nous… sous forme d’ateliers et de rencontres, notamment. Nous allons diriger l'atelier cette semaine dans cet esprit, tenter de répondre aux événements du monde, à la difficulté de notre temps : grands changements économiques, sociaux, en tant que theater makers, comment fait-on du theatre en réponse à ça ? en écho à ce qui se passe ? Jonathan propose de former trois groupes pour créer une image du changement. Chaque groupe présente son travail. Après-midi rencontre des membres du Fence. Quelle est la situation, le statut des auteurs dans nos pays respectifs ? Jonathan a été frappé (moi aussi) par « la voix qu'on ne comprend pas » une des étudiantes a fait un commentaire en arabe pendant leur image… « je ne savais pas qu'elle allait faire un commentaire par-dessus notre image. » C’était une voix qui n'était pas non plus en relation avec l'image. 15 mn en tout au total de préparation. Par deux. Certaines minutes sont plus longues que les autres !